Swing, slide or soak yourself to raise funds for the Noah’s Ark Children’s Hospital for Wales this summer! Team minimum sponsorship £400. Please sign up as an individual and we will be in contact for details on your team. 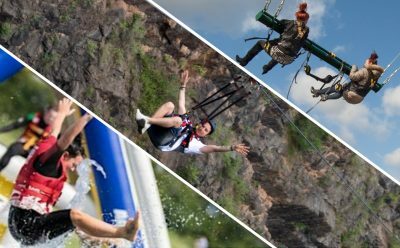 After the great fun we all had last year at our Zip Slide for Tiny Lives, we’re bringing it back for 2019, along with two brand new challenges for you to get involved in. You can choose to take part in one, two or all three. The choice (and the challenge) is yours! The exhilarating zip wire will take your breath away! Launching from a 70m cliff edge, this zip wire reaches speeds of up to 40mph along the 700m length of the spectacular NDAC Quarry. Register for the discounted price of £15pp and all we ask in return is that you raise a minimum of £100 in sponsorship for the Noah’s Ark Children’s Hospital Charity. Two more wires have been added, which means you can now race up to three friends to make the challenge that little bit more competitive. The event is also one of the few fundraising challenges open to younger people (12 years and over) so you can get even more of your friends and family involved. In order to take part in this challenge you must be taller than 1.2m (3ft 11″) and shorter than 2.0m (6ft 7″). The maximum weight limit is 120kg (18.8 stone) and the lower weight limit is 30kg (4.7 stone). For those thrill seekers looking for a new type of challenge, why not experience weightlessness 245 ft in the air with the ultimate adrenaline-pumping giant 3D swing! Register for the discounted price of £15pp and raise a minimum of £100 in sponsorship for the Noah’s Ark Children’s Hospital Charity. The swing can hold up to three people at the same time and is also open to younger people (12 years and over). Young people under the age of 16 need to be accompanied by an adult or guardian. In order to take part in this challenge you must be taller than 1.3m (4ft 3″). The maximum weight limit is 120kg (18.8 stone) and the lower weight limit is 20kg (3.15 stone). If you’re looking for a team challenge that’s breath-taking in size and fun, why not try the brand new NDAC attraction for 2019 – Atlantis Aqua Park! The aqua park lies over a depth of 60m of water and includes five floating zones made up of 91 different elements. Each zone increases in intensity, so you can challenge not only yourself but also your friends, family or colleagues to an experience like no other. What better way to spend the day than bouncing, jumping, sliding and diving all over the incredible floating Atlantic Aqua Park. All events will take place at Chepstow NDAC Quarry, on Sunday 30th June 2019. Anyone wishing to take part in more than one event will be asked to raise a combined sponsorship target. There is also a viewing area with a café and picnic space so you can bring your supporters along to watch and make a day of it!